Thursday President Dmitriy Medvedev made his most recent foray among the troops, and expressed what sounds something like a defense of his somewhat embattled Defense Minister, and his military reforms. He also congratulated General-Colonel Arkadiy Bakhin and Admiral Konstantin Sidenko after appointing them to be permanent commanders of the new Western and Eastern MDs respectively. 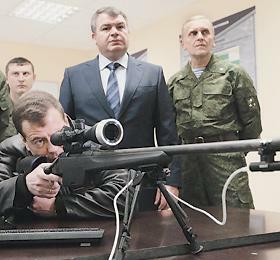 At the center, Medvedev inspected the school where Russia’s snipers are trained, and inspected the weapons they use. The school has practically every type of infantry weapon, including NATO ones. Izvestiya and Kommersant reported that officers there still venerate the Kalashnikov’s reliability and simplicity, but lament its ergonomics and low single shot density. A new Kalashnikov will begin testing next year, and Izvestiya imagines the officers told the President what requirements for the new weapon will be, since today’s Russian Army can afford to buy the best. Kommersant and RIA Novosti both noted that Kalashnikov lags behind Western manufacturers, so this all sounded a little like a rerun of recent domestic production vs. foreign procurement debates. Medvedev visited the nearby military town of Timonovo, and viewed newly built apartment blocks for Space Troops officers. Officers already in their apartments told Medvedev they are happy with the quality of the construction. The President also met several dozen residents, families, and military retirees. Some of the latter who served at Baykonur but received permanent apartments in Moscow Oblast complained of losing their higher pension ‘coefficient’ when they returned to Russia, and Medvedev promised to look into this. This was Medvedev’s first trip to see the troops in a while, and he seems like he generally doesn’t go too often or too far to observe them. He watched the naval portion of Vostok-2010 in July, and visited Alabino in May. This entry was posted in Military Housing, Military Leadership, Serdyukov's Reforms and tagged Anatoliy Serdyukov, Arkadiy Bakhin, Boris Gromov, Dmitriy Medvedev, Konstantin Sidenko, Solnechnogorsk, Timonovo. Bookmark the permalink.